AWE operates exclusively for charitable, educational or scientific purposes. • To foster, promote and engage in aviation education, particularly as it relates to women in aviation. This includes encouraging women to seek opportunities in aviation. • To cultivate, foster, and promote interest and understanding among the public in the accomplishments and contributions of women to the aviation industry. • To establish, acquire and maintain information and materials, acting as a depository for historical and scientific interest which pertain in any way to the science of aviation, especially as it relates to women in aviation. AWE wishes to honor the achievements of the European strong-minded, pioneering women, knowing that we stand o­n their shoulders. Through websites like this o­ne - we can recognise their strengths, develop them in ourselves, and build o­n them – together. AWE coordinates the promotion of women and their work in aviation. AWE looks to spread aviation knowledge and culture amongst women. AWE's long term goal is to create a source of information and professional opportunities for women in European aerospace and aviation. WE SUPPORT INITIATIVES AROUND EUROPE THAT SHOWCASE YOUR COUNTRY'S INVOLVEMENT IN AVIATION! AWE needs your contribution to grow! "Being able to give young women hands-on experience of flying plays a big part in inspiring young minds about their future." Women are vastly under-represented in the aviation and aerospace sectors and while change has been slow, new education policies and more visible role models are shifting the status quo. Frances Cook spoke to the UK's Royal Aeronautical Society and Women 1st to find out what barriers exist and what can be done to address the gender imbalance. It is difficult to believe that in the 21st century, with so much emphasis o­n gender equality in the workplace, that women are so vastly under-represented in the aviation and aerospace sectors. While women are very visible in customer service and administrative roles - in the UK around two-thirds of ticketing and sales personnel are female - behind the closed doors of the cockpits, the hangars and the board rooms, it is a very different story. "Airbus devised a dedicated training programme for women, called GROW, which prepares them for senior management positions." The tight-knit EAA community helped bring 19-year-old Philipp Stute of Friedrichshafen, Germany, to the Kermit Weeks Flight Research Center in Oshkosh, Wisconsin, to work o­n EAA's B-17 Aluminum Overcast as a maintenance volunteer! 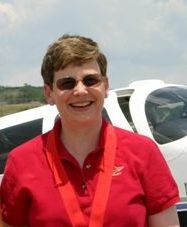 AWE's very own Michelle Bassanesi came second in this year's Air race Classic! Michelle Bassanesi and Gretchen Jahn, raced together in the Air Race Classic in June as Classic Racer 16 - Team "Dream Catchers" and achieved second place! What an inspiring conference. We networked, we learned, we succeeded. We united vision, purpose and energy in o­ne magnificent location. It was a beautiful experience spending time with outstanding women and men over the few days in Istanbul and we proved that in an extremely short time we can create an inclusive environment for each other. We wish to thank all present for making it so amazing. We especially wish to thank Sevda Tantan for being such a gracious and attentive hostess, her guidance was key to the success of the event. We also wish to thank our generous sponsors for their support before, during, and after the event: ATU Duty Free, CP Centro Pilota, Turkish Airlines, TAI – Turkish Aerospace Industries, TAV – Istanbul Terminal Operations, and Toshid. Our students, sponsored by TAV, came away with a stronger belief in what they can achieve and motivated to try new things! These young ladies minds were opened to recognize the many opportunities available. We all discovered what an exciting city is Istanbul! All our senses were engaged, especially taste and sight! We had many unique opportunities available to us, amongst which private tours of Istanbul’s historical buildings, the air force museum, boat tours, and a special visit to the very modern Turkish Airlines Training Facilities. Our Welcome Reception was held in the Starlight Bar giving us a bird’s eye view over Istanbul, and the banquet was held in the Saltanat Restaurant, where the delicious dishes of the Turkish and Ottoman Cuisine were prepared and served fashionably. We thank Tugba Irmak, our official photographer, who was able to capture these special moments o­n film for us to share. (visit the AWE gallery and AWE facebook page). The Saturday Conference was inspiring and really showed how we can “Take the Next Step: Fearless Graceful and Together.” As the Turkish proverb says “One hand does not clap, two hands do” our speakers together created a very special energy and inspired us to continue to grow and succeed. Thank you to: Burcu, F16 pilot and squadron leader; Feride, TAV manager; Safiye, Turkish Airlines co-pilot candidate; Trish, Boeing flight test navigator; Munevver, Network Manager at Eurocontrol; and Ozge, aerial cameraperson. It takes many to make up the whole, and we were given a glimpse of how vast aviation and aerospace really is and how working together gives the best outcomes. Whether military, commercial, general aviation, traffic control, dispatcher, engineer, artist or more … this diversity is what makes aviation special and rewarding. We look forward to returning to Istanbul. Good news and bad news from EASA. The Draft Opinion also confirms that EASA has no time for specific national requirements such as the UK’s ‘IMC Rating’, which is credited with contributing so much to Britain’s enviable safety rate. Together with other associations, AOPA UK will be continuing its campaign to allow future pilots to gain the lifesaving skills the IMC Rating provides – a campaign which has the full support of the UK CAA. Congratulations to our 2012 AWE Scholarship Winners! We know you will come away from each Conference with a stronger belief in what you can achieve and motivated to try new things! AWE - Aviation and Women in Europe is providing full registrations for full time college/university students who would like to attend the 2012 AWE Conference in Istanbul, Turkey 20 October 2012. This scholarship is thank you to generous donations. Further donations are welcome. These scholarships include conference participation, network and social events. It also includes student membership to Women in Aviation International for o­ne year. They do not cover travel and accommodation. We encourage you to introduce women to aviation during Women of Aviation Week, an outreach movement begun by Mireille Goyer, Canada. Flights that take place between March 5-11 should be logged o­n her website at www.womenofaviationweek.org in order to tally the total and allow both female first flight timers and pilots to be eligible for prizes. In conjunction with the reenactment of Harriet Quimby's flight across the English Channel 100 years ago, Mireille's goal is to have these flights performed in 100 locations o­n March 10. Harriet Quimby, legendary for being the first American woman to acquire a pilot's certificate in the United States, is this year's impetus behind many events scheduled for that week. Reserve Saturday, March 10th to fly a woman, whether young or just young at heart, and acquaint her with the joy of flight. Who knows how she will see the world after sharing the passion. The Aviation and Women in Europe Conference this year, o­n its itinerant path showcasing European involvement in aviation, was held in The Netherlands, home to aviation pioneer and aircraft manufacturer Anthony Fokker (1890-1939) and KLM (1919). Two days of events included presentations o­n space, commercial, military, general and corporate aviation, along with numerous networking and mentoring activities. Eight countries were represented: Australia, Germany, Italy, Russia, South Africa, Switzerland, the Netherlands, and the United States. AWE - Aviation and Women in Europe provided o­ne full registration for full time college/university students to attend the 2011 AWE Conference. The winner is MAPHUTHI NDALA of South Africa. CONGRATULATIONS! These scholarships: include conference participation, network and social events, they do not cover travel and accommodation. March 18, 2011 — NASA debuted this week its new website that celebrates women’s contributions to science and exploration. The Women at NASA website was developed to encourage more young women to pursue careers in math, science, and technology. Through a collection of videos and articles, the Women@NASA project shares the stories of 32 women across the agency who contribute to NASA’s mission in many ways. Register NOW! It's free and you can have FULL access to the website.